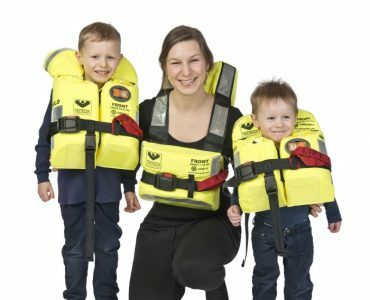 Available for adults, children and infants, the lifejacket has a crescent-shaped design so it fits passengers ergonomically and allows them to move easily when swimming gin an emergency. The compact lifejacket can also be quickly repacked and stored in a small space when it is not in use. “The PV9522 comes with a host of ingenious features. For example, the traditional crotch strap is redundant by design, significantly reducing the time and crew resources needed for repacking lifejackets after muster drills,” said Soren Hansen, global product manager for Personal Protective Equipment at VIKING. VIKING SOLAS lifejacket, Adult (PV9520) is made of three sections to minimize storage space without compromising safety features. Used for persons above 43 kg. Comes with whistle, buddy line, crotch strap and lifting strap. Prepared for light, attached or integrated (optional item). – Back panel for comfortable fit and easy donning and doffing PV9520 is top of the line SOLAS solid lifejacket designed to be folded to take up minimal space when stored. There is no dead buoyancy across the chest which means better freedom of movement for the user, which ultimately makes it easier to board the liferaft. The lifejacket has a back panel which provides extra comfort, and a side entry which ensures easy donning. It has an integrated donning instruction printed on the panel. The lifejacket is equipped with a crotch strap to ensure proper fit and performance after impact with water. The waist belt is 175 cm according to MSC.200 regulations ensuring one-size fits all for both universal and oversize crew and passengers. The lifejacket can be marked with customized marking of i.e. cabin number. Approved according to 96/98/EC and MSC-48(66, MSC-207(81) and MSC-226(82) compliant. 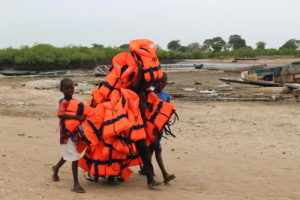 All lifejackets are produced and certified according to the updated MSC.200 regulation and according to ISO9001:2008. Partager la publication "The new VIKING PV9522 SOLAS Lifejacket"
« Equipements de protection individuelle Protection en milieu liquide.